Rick Piltz is a former senior associate in the coordination office of the U.S. Climate Change Science Program. In 2005, he blew the whistle on the White House's improper editing and censorship of science program reports on global warming intended for the public and Congress. GAP, which represented Piltz, released edited reports to The New York Times that documented the actual hand-editing -- by White House Counsel on Environmental Quality Chief of Staff Philip Cooney, a lawyer and former climate team leader with the American Petroleum Institute -- which was done to downplay the reality of human-driven global warming and its harmful impacts, and exaggerate scientific uncertainty. This scandal sparked a media frenzy that resulted in the resignation of Cooney, who found a job at ExxonMobil days later. "The scientific understanding of climate change is now sufficiently clear to justify nations taking prompt action." 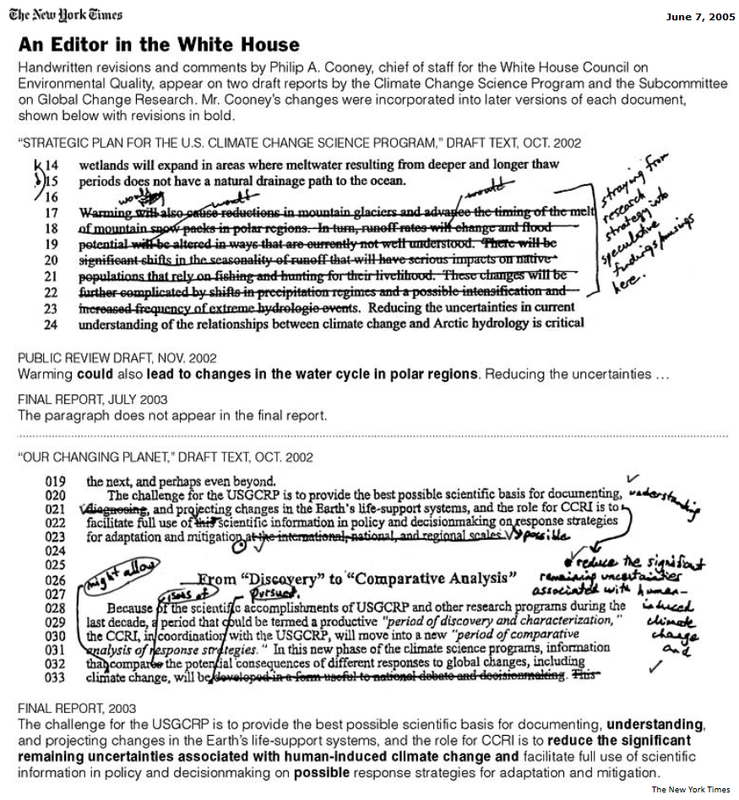 In an October 4, 2002, memo to James R. Mahoney, the head of the United States Climate Change Science Program and an appointee of Mr. Bush, Mr. Watson "strongly" recommended cutting boxes of text referring to the findings of a National Academy of Sciences panel on climate and the Intergovernmental Panel on Climate Change, a United Nations body that periodically reviews research on human-caused climate change. While those changes were made nearly two years ago, recent statements by Dr. Watson indicate that the administration's position has not changed. Perhaps Andy Revkin can redeem himself by authoring an appropriate obituary. That would be a tiny start. If he writes something, you can be sure it will talk more about himself that Rick, and it will have a good half dozen links to his own work and not to Rick's.